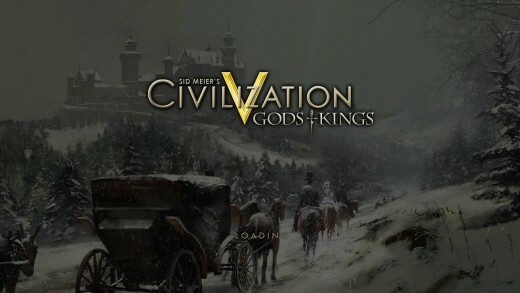 Playing Civilization 5 Gods & Kings while sick for past 3 days. 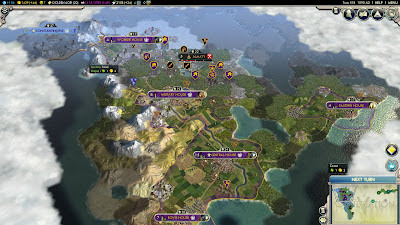 This is before the technology victory. While playing the game to make sense of it, it becomes a narrative. I suspect this is common to many who like this series. 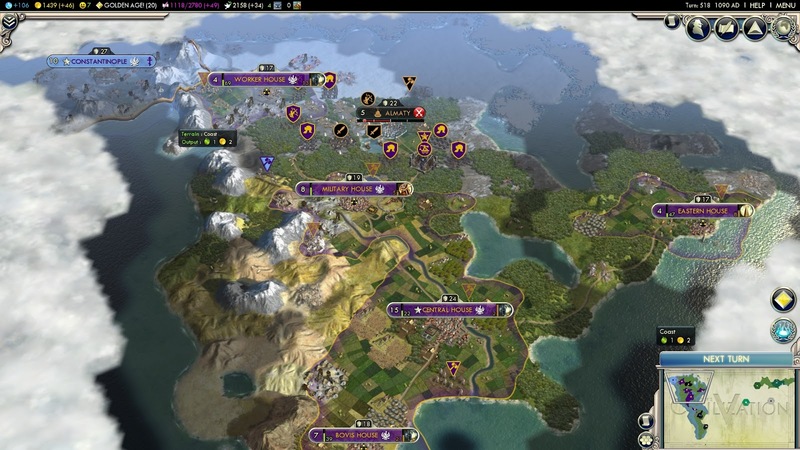 We are the Purple, "Romans" with a Zoroastrian religion, who eventually expanded to control the Northern American continent, thanks to the success of our Legions and had a colony in South America around 1000 AD, exploring the world in caravels. Around 1300 AD we were in a trade/ defense treaty with Light Green, who occupied around the Arabian Peninusla and India. The White who occupied Europe invaded Light Green around 1400AD and took their capital city, we had no military presence in the area and could do nothing. After a series of skirmish wars with the Blue, they invaded but they could not defeat our Legions and invading them was problematic, no borders changed and we were happy with peace with our eastern brothers (Blue). With the memory of our Light Green brothers, around 1400 AD we crossed the sea with the best units of the day Musketmen with cannons protected by Caravels and slowly reduced Whites cities and incorporated them as puppet states. We eventually made it to the Light Green capital city and liberated them around 1600AD. There were civilian and infrastructure issues in trying to control populations so far from our central government that we relied on puppets states and decided to cede some of the conquered territories to the Light Green to administer. Given the success of our overseas military expeditions it was deemed that incorporating African territories into our sphere of control was a realistic objective, so we invaded the African civilization which had a number of significant resources and historical achievements, this was done with our best and newest units of the time, World War One Infantry. This objective was achieved with a diplomatic cost. Instead of being viewed as "protectors against villans" by most world civilizations we regrettably acquired a reputation for being blood thirsty, this effected our ability to trade with them but at least they seemed scared. The Light Green became our allies with trade and defence pacts but were threatened by the Yellow who occupied Central European/ Asian area. 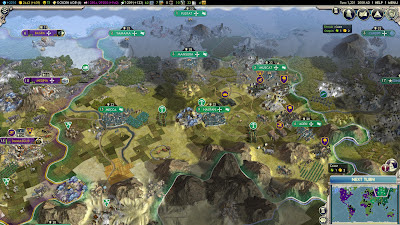 It became neccessary to support militarily the Light Green guys and maintain a presence in the area for stability, by this time our technology was early 1900 with Gatling guns, Artillery and World War One infantry while the general technology level of the world was late Medieval/ early Renaissance. The pacification of the Yellow was problematic, they had muskets and cannon against our World War One Infantry and Artillery but overtime was acheived, we took one of their minor cities to use as a Military Base to maintain a permanent presence in the region and ceded most of the conquered territories to Light Green. We also transferred 2 World War One Units to Light Green to support their military operations, this aid eventually became a tank brigade and destroyer as well. I sort of imagine the society to be similar to the one portrayed in the book "Hunger Games" by Suzanne Collins, at least the "Roman" influenced technologically advanced society centered around North America. Well finished that, that was three days..